Read folk tales from China collected by R. Wilhelm, Norman Hinsdale Pitman and Andrew Lang. Jump to full list of Chinese folk tales. About: China’s folklore is part of their country’s proud tradition, with hundreds of stories beloved by both young and old. Many of the folk tales and fairy tales are used to teach certain admirable characteristics in individuals. These values include moderation, the value of promises, respect for one’s elders, why you should follow the ways of the culture, justice and injustice, and the power of wisdom. The tales shine light on the traditions and culture of China throughout all of its years. Some of the folk tales seek to answer questions about the world and are shaped by China’s philosophies. “The crows come flying and form a bridge over which the Weaving Maiden crosses the silver river”. 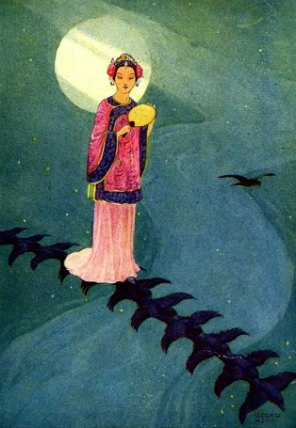 Illustration by George H. Hood from The Chinese Fairy Book by R. Wilhelm, published 1921. These types of tales are in presented in the folk tale collection The Chinese Fairy Book by R. Wilhelm, an avid scholar of China.The book’s 74 tales feature a cross-section of Chinese folklore, including tales of the gods, tales of magic, fairy tales, ghost stories and more. Other collections with a rich selection of Chinese folklore include A Chinese Wonder Book by Norman Hinsdale Pitman and Chinese Folk-Lore Tales, edited by Andrew Lang. Chinese folklore is influenced by the country’s religions such as the beliefs of Taoism, Confucianism and Buddhism. Like Japanese folklore, experts believe Chinese folk tales were influenced by West Asia and India. The animals in Chinese folk tales often have human characteristics, and can speak, reason, and perform tasks in the same manner as humans. Want more tales? Check out the Fairytalez book Chinese Tales: An Enchanting Collection of 24 Chinese Folk Tales and Fairy Tales, now available in Kindle and paperback.